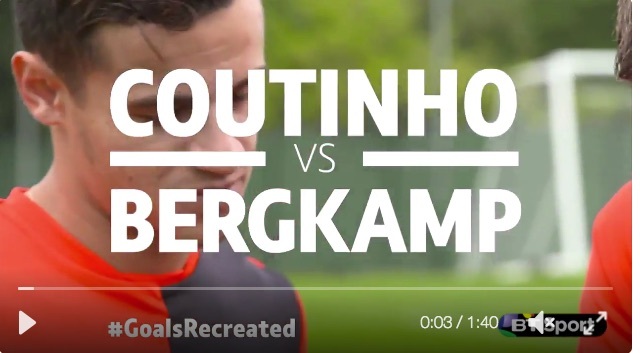 BT Sport are travelling round training grounds at the moment and getting Premier League stars to recreate famous goals. It’s pretty good craic, actually, and this time it was the turn of Coutinho. Our Brazilian was tasked with scoring Dennis Bergkamp’s ludicrous goal verses Newcastle, where he ended Nikos Dabizas’s career with one of the most beautiful turns ever seen! James Milner also got involved, recreating Gianfranco Zola’s famous flick finish for Chelsea (although strikers do this all the time now!). First time, as is standard for the world’s best left-back, Milner finished with aplomb – earning a boot clean from his mate Coutinho in the process.